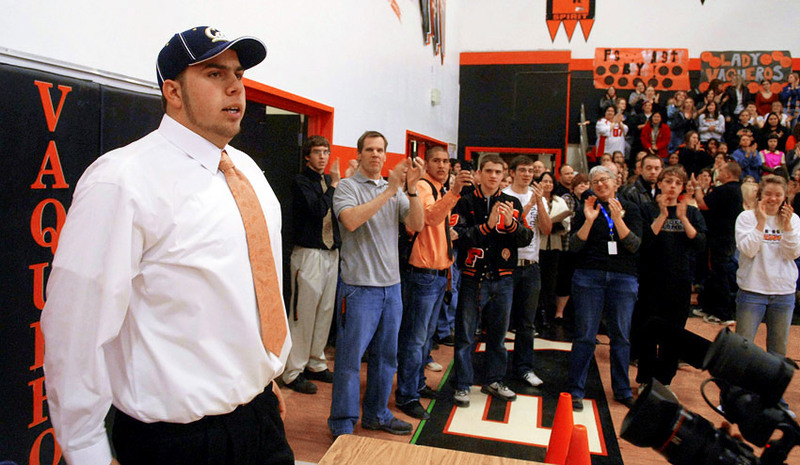 For full coverage of 2009 signing day, click here. So that's how a fantasy, a whopper, saw the light of day. It was a million things. What began as teenage insecurity ended up morphing into one of the tallest tales in college football history. One calendar year ago, Kevin Hart, a no-name offensive lineman from Fernley, Nev., staged a farcical news conference, fibbing through his teeth and announcing he'd be playing football for UC Berkeley -- even though Cal didn't recruit him, eyeball him or talk to him. the buddies on his MySpace page. They all stood up to roar and clap. To every one of them, it was a seminal moment. Someone from the dusty town of Fernley, going D-I? Not in their wildest dreams. But, yes, in Kevin Hart's dreams. And never discount someone's dream. The crowd at Fernley High roared its approval after Kevin Hart's big announcement ... but the story would quickly unravel. At least he grew up near Cal Berkeley. Until he was 14, Kevin Hart lived in Oakley, Calif., about 48 miles from campus, cheering for the Bay Area's teams. He rather enjoyed baseball, but in almost all of his childhood photographs, Kevin is posing with a football, clutching it tightly. 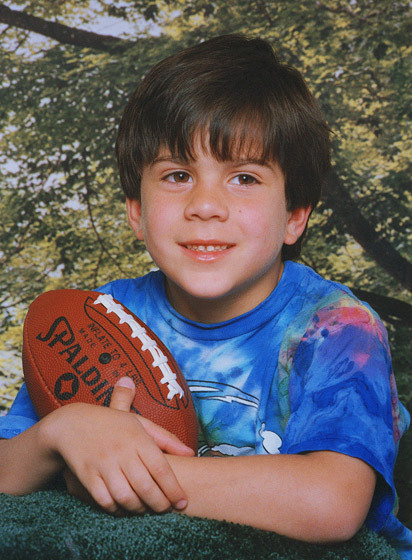 In his childhood photos, Kevin always displayed a love for football. He wanted to play Pop Warner, but the weight limit always disqualified him. He was big-boned and too heavy to be eligible, so it was flag football or nothing at all. His choice was a flag league at the YMCA. He was no spectacular athlete, but he was a sports encyclopedia and knew the difference between a zone blitz and a strongside blitz. Coaches were thrilled to have him. He'd crack one-liners and would have teammates over to watch Cal, Stanford, Oregon or the Pac-10 game du jour. But soon, his parents, Rick and Marlene, were looking to get out of Oakley. Rick was an estimator for an auto repair shop, with a junior college education, and the money wasn't pouring in. Marlene, a grammar school teacher, had a nominal salary and could help only so much. They heard about a place on the outskirts of Reno, a rural community named Fernley, where the cost of living was lower and the jobs seemed secure. So that's where Rick, Marlene and their four kids headed -- to a two-stoplight town of 13,000. Their oldest, Kevin, seemed distracted. His favorite aunt, Paula Wakeman -- who used to take him to Oakland A's games -- had suddenly died of cancer at the age of 45. The loss, coupled with the move, seemed to send Kevin into a shell. He was a high school freshman, which can be overwhelming socially and academically, and the sheer size of his body didn't help his self-esteem. The only upside was there was no weight limit in high school football -- a good thing, considering he weighed more than 300 pounds. "I saw him in football practice the first day," says Zack Betts, a feisty little linebacker who is the same age, "and I was like, 'Geez, who's this big kid? He can't be a freshman.'" The worst part was the big kid was getting shoved around. Betts remembers him being slow -- "a slug" is his exact phrase -- and Kevin's grandfather, George Hart, says Kevin couldn't even come close to lifting his own weight. "I don't know what his bench [press] was," George says, "but I'm going to say less than 100 pounds. He was just a big ol' marshmallow." Fernley's popular varsity football coach, Dave Hart (no relation), barely knew the kid existed. In 25 seasons at Fernley, Dave Hart had seen big linemen come and go, and he wasn't about to order every pudgy kid to a weight room. In fact, the coach didn't have a mandatory weight-training program at all, much less a temper, which was why he was beloved and also perhaps why Fernley had become a perennial loser. The other problem was he seemed hell-bent against the forward pass. The coach's license plate read, "Veer 38," which told people, including opponents, everything they needed to know. It was an offense from the Dark Ages -- run the ball or bust -- and, because coach Hart didn't have Barry Sanders, usually it was bust. Not one Fernley player had ever earned a Division I football scholarship. So, if Kevin was ever going to amount to much, football wise, Dave Hart wasn't going to be the guy to push him. Kevin needed to lose his love handles, or at least find out whether he had pectoral muscles, and it helped when the school made a coaching change following Kevin's freshman year. 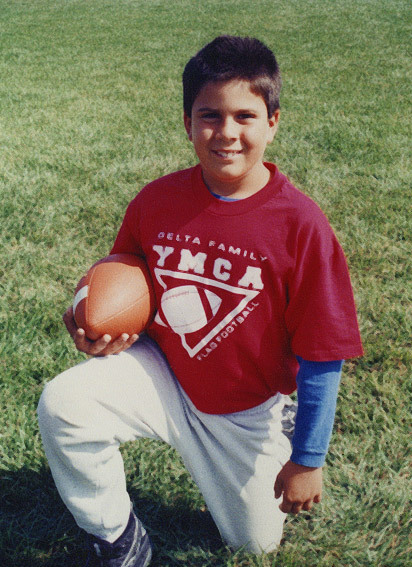 Unable to meet the weight limit for Pop Warner, Kevin took his pigskin passion to a YMCA flag football league. Dave Hart's replacement was Mark Hodges, a ball of fire who wasn't fond of losing. After a prep career in Riverside, Calif., Hodges had been a graduate assistant at Southern Oregon University before spending 12 years as a head and assistant coach at South Medford and North Medford (Ore.) high schools. As an assistant at North Medford, he'd been to two state title games and had mentored two future college quarterbacks, plus a defensive tackle who wound up playing at Oregon. This wasn't some neophyte; this was a no-nonsense, 21st century coach who knew all the nuances of building a program. There'd be mandatory weightlifting, offseason workouts and maybe seven-on-seven passing drills, if someone at Fernley could be taught to throw a spiral. What Hodges needed most, though, was bulk and talent and, in the summer before his debut season of 2005, his eyes bugged out at the sight of Kevin Hart. At the time, Kevin was playing first base for the Fernley summer baseball team, having eschewed the football workouts altogether. As much as Kevin loved football, and wished he could dominate, no one had mentored him on line play or even encouraged him, and he was too new to Fernley and too shy to beg for help. But Hodges wasn't shy. He saw 6-foot-4 and 325 sloppy pounds of potential pass protection and remembers telling a staff member, "That guy over there looks like he could play a little football. He looks intent on what he's doing and focused. Let's have a chat with him." The chat consisted of: "I want you; I hope you want us." Kevin was grateful to be noticed, grateful not to be an outcast at school anymore. Hodges gave him a detailed weightlifting plan, and, weeks later, when a bicep appeared, Kevin was sold. It was that way with most of the players. The once-moribund varsity began to chalk up victories -- five, to be exact -- although trouble was brewing. Five of Fernley's new players apparently had transferred in from Oregon, along with Hodges, and -- although Hodges reportedly thought they'd been cleared by the school -- the Nevada Interscholastic Activities Association ruled them ineligible. The coach also was investigated for holding illegal full-squad Sunday practices, and the NIAA ended up forcing the school to forfeit its entire season. The chaos had the Fernley fan base yearning for the good ol' days -- uncomplicated 3-7 seasons -- and many took out their anger on Hodges. A local grandmother told him, "Don't settle down here because you're going to go." People close to the coach say someone shot the window out of his car. But he also had his share of supporters, including Kevin's grandfather. George Hart, a retired welder and crane operator, had moved to Fernley to watch his grandkids grow up. And he marveled at what Hodges had done for Kevin. "Before, he couldn't get up out of a squat with his own weight," George says. "But now he was squatting 500 pounds." It had taken just one season, a sophomore year on the junior varsity, for Kevin to be transformed, body and mind. The once introverted teenager was back to his Oakley self: loud, wisecracking and reciting college football statistics. "It wasn't so much quiet Kevin anymore, it was obnoxious Kevin," says his teammate and friend, Betts. And it wasn't just Hodges directing this transformation; it was also Hodges' right-hand man, offensive line coach Chris Kribs. Kribs was everything a Fernley kid could aspire to be. He was a massive 300-pounder, a former starting right guard at Western Oregon University who could dead-lift 700 pounds and dunk a basketball from a standing start. He'd also had a cup of coffee in NFL Europe, giving him instant credibility. But, more than that, he was genuinely invested in his players. He took them to restaurants, had them over to his home and demanded maximum effort. He told his linemen that his college jersey number was 77 and that none of them was near-qualified to wear it. It was his way of challenging the group, and one day, before the 2006 season, a brazen Kevin Hart tapped Kribs on the shoulder. Inspired by offensive line coach Chris Kribs, left, and head coach Mark Hodges, Kevin developed into an all-state offensive lineman. "I'm going to show you I am qualified,'' Kevin said. Before long, a No. 77 jersey was folded neatly in Kevin's locker. And it wasn't charity, either. Kribs and Hodges were impressed by how Kevin had changed his diet, dropped to less than 300 pounds, lifted weights after hours and even practiced with significant injuries. "Very coachable," Hodges says of Kevin. "A very good teammate. Good leader. Never missed a practice, never missed a workout, was encouraging to other people, players, younger players and good in the locker room, funny. "His mobility for a guy his size was real good. I mean, real good. Paid attention to detail, really got down the footwork." Kevin thanked Kribs profusely for No. 77 -- "Coach Kribs is like a second father to me," he told friends -- and wound up having an admirable junior season, his first as a varsity player. He was named all-state, largely on Hodges' recommendation, and his name filtered out to some recruiting services. So that's how it started. That's how, in April 2007, Kevin began receiving mail from D-I colleges. These were basic, nondescript recruiting letters, but they were novel to Kevin just the same. They arrived from the universities of Washington, Oregon and Nevada, to name three, and there were even a few from Ivy League schools. The truth was, Kevin could name the 10 head coaches in the Pac-10, but likely not the last 10 presidents of the United States. School had never been his passion, which is common and understandable, but you need to mix in a few Bs and Cs if you want to play on Saturdays. According to Kevin, Hodges never saw Kevin's academic transcripts, only the eligibility list. The problem wasn't necessarily his smarts. Kevin just wouldn't or couldn't apply himself, for whatever reason, and no one was holding him accountable -- not his distracted parents, not his oblivious coaches and certainly not the high school administration at Fernley. Kevin, in his early stages of high school, found out that Fernley students were eligible for athletics as long as they earned passing grades. In other words, a lowly 1.5 grade-point average could still land you on the field. "Most of the football guys simply shoot for Ds," says a Fernley student who wishes to remain anonymous. "They don't care about school." The administration wasn't exactly raising the academic bar this way, but someone forgot to tell the parents, or, at least, didn't tell all the parents. Kevin's mother and father worked full time, attended church daily, had four kids to raise and trusted Kevin implicitly. So much so they didn't ask to see his report card -- not even his mom, who was a third-grade teacher. "And they should've checked," George says. "I blame his parents. But when you start pointing fingers, you've got three pointing back at you. So blame me, too." Hodges' staff, according to Kevin, was just as hands-off. He says they would see updated eligibility lists but never actual transcripts. They seemed to have no idea Kevin had ripped open his report card to find a ghastly 1.8 GPA. The kid was skating though high school with a D average, and either the coaches didn't want to know or didn't want to ask. "Well, he tried in my [weightlifting] class, I know that," Hodges says. "On the rest of it, I can't comment on." It probably didn't help that the school had two interim principals in Kevin's time at Fernley and three athletic directors, as well. Continuity in leadership appears to have been an issue, because everywhere else in the state students were forced to earn a 2.0 GPA to remain eligible for sports. Fernley's explanation, according to Eddie Bonine, executive director of the NIAA, was that the school went by a statute in the NIAA handbook that says student-athletes must pass every class or have at least a 2.0 to be eligible. But there's another statute, No. 386.806, which states an athlete must have both passing grades and a 2.0 -- a statute to which the rest of the schools in the state adhered. Kevin definitely enjoyed the status of being a star football player on his high school campus. and that has been rectified. With a 1.8, Kevin Hart [should have] been ineligible to participate." If the authority figures were in the dark, Kevin's classmates had long been dubious about his academic prowess. One student, who asked to remain anonymous, told his parents, "That Kevin Hart kid, he's always got an 'F,' and he's always on the grade check list every Friday." Kevin just seemed ill-prepared and disinterested, a cut-up who often arrived to class casually late. That's not uncommon in any high school, where blasé can be cool, but Kevin certainly didn't have the vibe of a serious student headed for college. What he did have, though, were recruiting letters, more and more every day. Hodges would sometimes pass them out to him after meetings, and his teammates couldn't help but stop and stare. Kevin was in no way deliberately flashing them, but jocks will be jocks, and he began showing some bravado in offseason workouts, calling himself "D-I" and telling the guys about all his upcoming campus visits. These were Kevin's halcyon days, and you had to cut him a break -- he hadn't had too many up until then. Two years before, he was a creampuff who'd never played a down of organized football, unless you counted his YMCA flag football career as a 10-year-old. He had been the new kid in school, nearly twice everybody's size and looking for acceptance. If he couldn't contain his unbridled joy, so be it. Being recruited, being someone, was intoxicating. But his peers weren't about to let him revel in it forever. They'd hear him boast, "I'm going D-I," and, being teenagers, they didn't mind tearing him down, straight to his face. "They would just tell Kevin, 'Hey, you can't do it, you'll never do it, you're too stupid,'" Betts says. "Just a lot of rude things. They would call him an idiot. He's not stupid by any means; he just wasn't the smartest one in the classroom. And a lot of kids would really pin him on that." In some ways, this was the genesis of the upcoming scandal: pure pubescent peer pressure. At home, Kevin kept his beloved letters in a shoe box, but it might as well have been his self-esteem in there. How dare these kids at his school steal that away? "A lot of kids doubted him," Betts says. "I'm not gonna lie. I'm his friend and I care for him, but I did doubt him. I mean, a Fernley kid, the first one ever getting recruited by a D-I school. I mean, that's huge for a small town like this. I would say more kids doubted him [than believed him], and that I guess drove him even more to try to become a D-I athlete." Meanwhile, Kevin, for as much as he watched ESPNU, was still naive about the world of college football. These recruiting mailers he was getting were essentially form letters, impersonal and mailed out in bulk, yet he let his imagination run wild. Washington seemed to be the most aggressive suitor, sending him its literature about once a week, and he asked his parents whether he could take a day trip to Seattle, by himself, for an unofficial visit in spring of his junior year. His parents were somewhat strapped financially, but George Hart wasn't going to disappoint his eldest grandson. He says he paid for the flight and the taxi service, under the impression Kevin had a meeting set up with the Huskies offensive line coach. Kevin says he stayed a day, took in a Mariners baseball game and flew back that night. He told his grandpa he'd watched a spring practice and kibitzed with the coaches. But it didn't quite go down that way. Marlene and Rick Hart were hopeful that their oldest child could land a college scholarship. "I went up there, I liked it," Kevin says, "but I didn't really think they knew who I was very much. So I sent them a tape and my transcripts, and that's probably why I never heard back from them again. I'm pretty sure it was the transcripts." It finally dawned on Kevin that, academically, he wasn't D-I-ready. But that was his secret and his secret alone. He wasn't going to rush back to Fernley and validate all the stooges who had questioned his IQ. He was now the BMOC, walking the halls of the school with a swagger. He was all-state! He couldn't come clean now, could he? He couldn't say, Oh well, it looks like junior college for me. His parents were already thrilled at the prospect of Kevin getting a free education. His grandpa was already envisioning game days. His coaches, Hodges and Kribs, were already using Kevin's imminent ascension to motivate their underachievers. He couldn't possibly turn back now. So he began to lie. The con grew incrementally, like Pinocchio's nose. Where it would all end, Kevin couldn't predict. But, in the summer of '07, after his junior season, his imagination was just getting revved up. He asked to attend the University of Oregon football camp, to see how he stacked up against other D-I recruits, and his grandpa again laid out the cash -- and flew up with him this time. The coaches, by and large, noticed how gung-ho Kevin was and how he kept teammates in stitches, but there was no clear physical evidence Kevin was a D-I player. Contrary to what Hodges was saying, Kevin's balance, footwork and upper-body strength were middle-of-the-road. He was at best a borderline prospect, a walk-on candidate. But enthusiasm and love of the game do count for something, and George says he witnessed the Ducks offensive line coach, Steve Greatwood, toss Kevin a bone. "Coach handed him some questionnaires," George says, "and told Kevin, 'Fill 'em out, and we'll see what we can do about getting you up here in a year.' And that was a quote." Of course, what George didn't know was Kevin threw the questionnaires in the trash. "It would've been a waste to send it in," Kevin says, "because I knew I didn't have the grades. And because I didn't have the grades, I figured there's no point taking the SATs. "I kept it to myself. I was embarrassed because, like, I wanted to live up to everyone's expectations and couldn't deal with people at the time knowing that I failed. I just wanted to be someone, and when I couldn't be that person, it was tough, and I didn't know how to really explain that to people or tell people that." On the plus side, Greatwood had fed the lie, fed it big time. George relayed Greatwood's comments to Kevin's dad, Rick, who told Hodges, who told Kribs, who told God knows who else. Oregon was intrigued! That was the word all over town -- and, mind you, this was no metropolis. Kevin simply shut his mouth and enrolled in another camp, at the University of Nevada in Reno, 32 miles down the road. This time, there seemed to be legitimate interest. The last thing Nevada could afford to do was overlook an in-state prospect, particularly an all-state lineman from normally inept Fernley. It just would've looked bad if they didn't evaluate Kevin, and, honestly, Hodges wouldn't have let them ignore the kid, anyway. "I know his coach liked him and thought he was a heck of a player," says a Nevada staff member who wants to remain anonymous. "He was really pushing him." 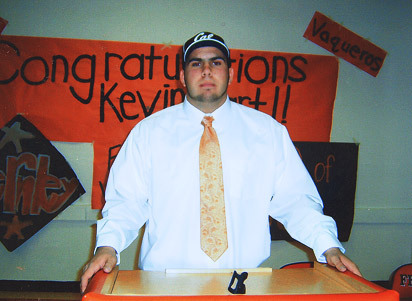 Buoyed by a box of recruiting letters, Kevin told everyone that he was "going D-I." But Nevada was ultimately underwhelmed by Kevin. 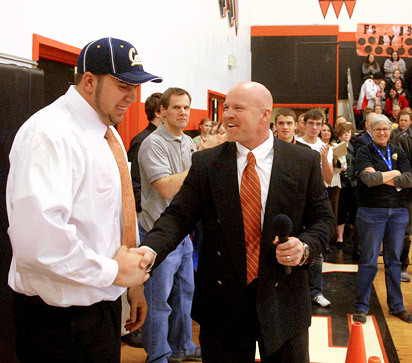 First of all, under head coach Chris Ault and O-line coach Cameron Norcross, the Wolf Pack preferred fleet, athletic linemen; Kevin was a plodding heavyweight. They rated him as a potential walk-on they would revisit down the road, during his upcoming senior season. "He would've been a marginal player for us," the Nevada staffer says. "Having had him in our camp, up close and personal, gave us more insight, as opposed to just seeing him on film, against other small Nevada schools." At least Kevin finally knew where he stood -- on thin ice. Nevada hadn't asked for his transcripts and Oregon had left it up to him to send them in. These schools obviously weren't going to be banging down his door. But why did anyone else have to know that? "I already had a bucket full of letters," Kevin says, "and that's pretty much what put people's minds at ease that it wasn't a fabrication. And [the lie] just kept going and going. There's not really one point that you could sit there and say, 'That's the whole story.' Just 'cause it kept going and going." Q: How many schools have recruited you? Names and details. A: Well, right now, there are a number of colleges recruiting me to play football: Nevada, Boise State, Washington, Oregon, California and Oregon State. But the schools that I am in contact with are Nevada, Oregon and Washington. Oregon and Washington have offered me full-ride scholarships. Right then, he was officially in too deep. The lie was public now, in print, and the gaudy photograph accompanying the article showed Kevin in a Heisman pose. But had Oregon and Washington ever contacted his parents for an in-home visit? No. Had they asked Hodges to send film? No. Had they called a school administrator asking for a transcript? No. Had Kevin registered with the NCAA Initial-Eligibility Clearinghouse? No. All this should've raised the reddest of flags, but Hodges and Kribs and George and Rick and Marlene read the story and didn't bat an eye. Says Rick: "We thought the coaches were handling it, and the coaches thought we were talking to the recruiters." Says Hodges: "Yeah, colleges will contact a high school coach. But it depends on the situation. They can contact him a lot; they can contact him a little bit. They can contact parents; they can contact the school. It depends. Each individual situation is different." Says Kevin: "That's the thing that bothers me -- when they blame my coaches, my parents about, 'Aw, why didn't they stop this? This could have been stopped.' Sure, it could've been stopped -- by me. I could've put an end to the whole thing in September by saying, 'I don't have the grades, so I'm going to go to a JC.' But I didn't do that. "You have to understand, they put a lot of trust in me. I just told [Hodges] I was taking care of it myself, as far as sending tapes out, talking to coaches, my grades. I wasn't popping up on ineligible lists, so he thought my grades were fine. Rick Hart says he thought the Fernley coaches were handling the details of his son's recruitment. "I thought it would be too hard on them to find out it wasn't going to happen, so I kept it to myself. When people look up to you in the school and you're kind of big man on campus, it's hard just to tell them that, no, I can't do this, and you go back to being a person in school. Because for me, I was big man on campus for a while." But not everyone was fooled. Not completely anyway. Several of Kevin's teachers, some of whom had issued him failing grades, gasped at the article in the school paper and then e-mailed Bonine, the former Fernley pricipal who runs the NIAA. Kevin's senior season only furthered the charade. He was named the state's top lineman, and Hodges finally had moribund Fernley in the state semifinals. The team blew a late 34-20 lead and lost 35-34, but, from the outside looking in, it appeared the players had ridden Kevin's backside to one of the most special Fernley seasons ever. George claims Nevada coaches twice visited the school to take a final look at Kevin -- the first time, Ault and Norcross showed up together and the second time Norcross came alone. The two coaches, who declined to comment, never seemed sold on Kevin. But just their presence in Fernley gave the lie helium. 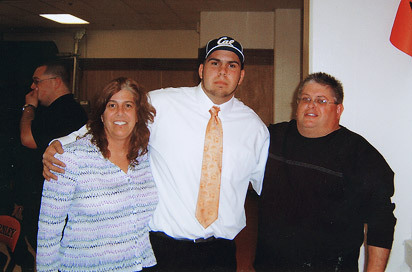 By January 2008, with national signing day only a month away, Kevin had to decide whether to finally to tell the truth. He says he'd lay in bed "just about every night," playing out scenarios, and he came to an absolutely ludicrous decision: hold a news conference. finally picking a school. 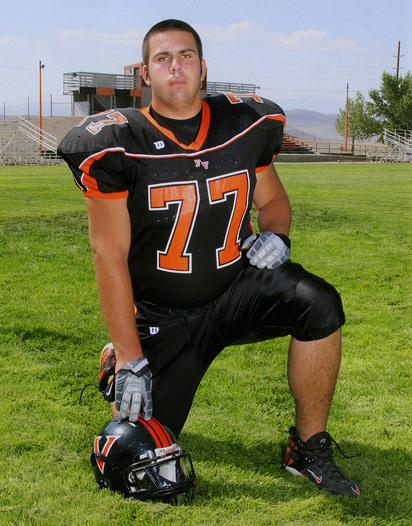 In Kevin's head, that's what the first D-I player in Fernley history needed to do. Had to do! Every Monday after the football season, classmates would ask him, "Which coaches you talk to this weekend? Get any more offers?" In other words, he couldn't just slink away, hoping the student body would forget. He had to pick a school, and to complete his masquerade, he needed to do it publicly, at a packed news conference. He asked Hodges whether it was OK to stage one, and the coach thought it was a brilliant idea. But, to be fair, the coach was pretty distracted by this point. Because of the ineligible players he'd brought with him from Oregon, Hodges had been under fire from the moment he took the job three years earlier, and later there'd been accusations that he spent an unauthorized $26,000 from the athletic budget on new uniforms. He began looking for a way out, and in the 2007 season, he heard that one of his former principals in Medford, Ore., was now at Hermiston (Ore.) High School and was searching for a new head coach. There was contact between them, and by season's end, Hodges was hoping, almost expecting, to land there. So, what better way to go out -- sending a kid to big-time college football for the first time in Fernley history? Hodges wasn't questioning anything; he just set the wheels in motion for a Feb. 1 announcement. He called TV stations in Reno and arranged for the entire student body to be there. He'd get the pep band, he'd get streamers. It'd be an all-out event. Kribs couldn't contain his excitement, either. He and Kevin had grown closer during the season, with Kribs often using Kevin as a teaching tool. The coach, who'd last played college football in 1999, would put on a helmet during practice and go one-on-one with Kevin to prove points to his other linemen. The coach would whip Kevin, but they would laugh about it afterward -- the two 77s. They also would talk about Kevin's college choices, and Kevin -- with an absolute straight face -- told him the decision was down to Cal and Oregon because both schools ran offensive systems similar to Fernley's. Kevin had an answer for everything. He eventually told Kribs he was going to pick Cal because, among other things, he had grown up in Northern California and wanted to play back home. Chris, I think there is some misunderstanding here. We have not offered Kevin a full-ride. Are you sure he's not going to Oregon? Let me know. You have me wondering. A confused Kribs called Kevin for an explanation. The kid was busted! It was over! Or it should've been. But Kevin tap-danced and told Kribs that Cal had to tell him that. He told Kribs that schools aren't allowed to comment on recruits, which is why Michalczik had denied it. Kribs believed Kevin. Why wouldn't he? The kid was his protégé, had eaten cereal at his kitchen table. So all systems were still go. The night before the news conference, Jan. 31, Kevin posted a bulletin on his MySpace page, saying, "Tomorrow is the big day." Zack Betts, his teammate since freshman year, was online to see it and asked Kevin to give him the scoop: Cal or Oregon? Kevin was reluctant to say, but eventually told Zack, "I'm going to Cal." Betts promised not to tell a soul. "It all made sense," Betts says, "and I didn't 100 percent believe him until that point." There was just one other tiny detail left: What would Cal say? What the hell would Cal say? But, as he stepped to the podium Feb. 1, 2008, in front of roughly 900 people, Kevin Hart wasn't of sound mind. He admits it. He'll tell you he was "out of control." He'll tell you "Mentally, I wasn't there." He'll tell you he was delusional, that everyone had believed him up to that point and he figured it would stay that way. He'll tell you, "I didn't see any consequences to any of it because I was not in the state of mind to realize what was wrong or right, really." He'll tell you he thought Cal might let him slide. He could have been Terrelle Pryor, choosing between Ohio State and Michigan, because Kevin had the room eating out of his hand. Hodges, wearing a suit and tie, grabbed a microphone, walked to the middle of the gym and announced: "He kept believing and he worked very hard to get to this point, and now Kevin is ready to make an announcement of where he's going to go to college." There was bedlam, and Kevin, in strong, commanding tones, said, "I just want to say thank you to my family over there and everyone at the school's been so supportive of what I've been doing, and I appreciate all you guys, and I'll never forget where I came from." Grandfather George Hart referred to the recruiting day hoax as a "skit." On a desk in front of him was a Cal cap and an Oregon cap, and, never straying out of character, Kevin said, "After sitting down with my family, I came down to two choices. It was Oregon and Cal. And I decided that, uh, I'm gonna be playing football at the University of California." Q: What was the deciding factor? Kevin: Coach [Jeff] Tedford and I talked a lot, and the fact that the head coach did most of the recruiting of me kind of gave me a real personal experience with that coach. And we had like a really good relationship. Q: When did you make your visit there? Well, I've been up there a few times, but, you know, it really wasn't even the visit; It was the tradition there. Q: How nice is it to finally have this over with? You can finally be a senior in high school. Kevin: I didn't really have a bad recruiting experience, but like every other guy, I'm glad it's over. I'm glad it'll just go back to normal. He told the group he'd been duped by a middleman, a promoter he'd hired to contact schools and deal with coaches. He claimed this impostor had set him up and taken his money. They asked him who this person was, and Kevin had to think up a name out of thin air. He said, "Kevin Riley" -- which just so happened to be the name of the Cal quarterback. "That was probably the worst of it, I think," Kevin says. "I made up a story to make it sound better, I guess. I just told another lie." The next day, the police were called in to investigate this Riley person, but of course Kevin couldn't produce a phone number or address for him. His imagination was running on empty, and he finally confessed. "I couldn't take it anymore," he says. Days later, he released a public apology, admitting to a 10-month hoax, and was told to stay home from school for a week. Fingers were being pointed every which way. Nationally and locally, people blamed his parents for being naive about college recruiting, for being utterly out of touch, for being too detached. "I wish Kevin would've came to us, talked to us," Rick says, "and told us that he didn't have his grades or GPA up high enough. We could've worked with him somehow to get that. We could've hired a tutor. It was degrading to both my wife and myself. We're not disappointed in him, we're just disappointed in the actions that led up to all that. We wish he'd handled it a different way and not lied. Kevin still has trouble with the fact that he deceived his coaches, especially Kribs, right. "I've heard a lot of comments about, 'Aw, this guy, the parent, he should have known what the process was for recruiting.' Well, I didn't." But the person getting blistered most was Hodges. "Listen," says a college coach, after requesting anonymity, "I can't believe he didn't know the process. A college coach who's recruiting a kid is going to be in the school or the home at some point. Jeff Tedford and Mike Bellotti? They're in the school and in the home. I can see the parents being naive, but I don't know how you can be a high school coach and have a Pac-10 recruit and expect they're not going to call you. They're spending over 100 grand over a five-year period on a kid. There's no way they're not calling the high school coach. They've got to be thorough. Their job is on the line." The Lyon County School District, where Fernley is located, seemed to agree with that premise, and on Feb. 8, Hodges was informed his contract would not be renewed following the school year. According to reports, the district was citing him for "unprofessional conduct and fiscal irresponsibility," and Hodges responded by filing a defamation of character lawsuit claiming he'd been made a scapegoat for the Hart affair, a lawsuit that he would later lose. They were firing him just as he was about to quit, but either way, he was out at the end of the school year, thrilled to be taking the Hermiston job. "There's no one who was more of a sucker than me," Hodges says of Kevin's lies. "But it was a perfect storm. There were letters and phone calls from coaches. He's all-state, the best lineman in the state, things I can't even tell you. Plus, I'm teaching and getting ready for the next season. I missed it, because, like I said, it was a perfect storm." Fernley High School administrators will not comment on Hodges or the eligibility issue and instead referred all phone calls to Lyon County associate superintendent Terri White. White also has refused comment. Still, changes were looming, and Fernley's interim principal and interim athletic director from the 2007-08 school year were soon replaced. But lost amid the lawsuits and the blame games was an 18-year-old kid weeping at home. Kevin, the minute his lie blew up, lowered the shades of his house and assumed the fetal position. "I thought I'd be in the gutter somewhere," he says. Betts and several of his friends called to ask whether he wanted to meet for breakfast one morning, and Betts considered Kevin over-the-top depressed. "I mean, it was an almost suicidal kind of down," Betts says. "I was scared he might do something to hurt himself." By Friday, Feb. 8, one week after the news conference, Kevin was in therapy. It was George's idea, because, George says, "I love my grandson, and I didn't have the vocabulary or background to lead Kevin out of this." Devastated, George was already referring to the news conference as a "skit" and "baloney," and, after Kevin's first appointment, he half expected the therapist to say his grandson was beyond repair. But the doctor, according to George, said, "He's opening up to me. I can see a light at the end of the tunnel already. I can help him." George booked five more appointments. By that Sunday night, the night before Kevin's first day back at school, Kevin and some players huddled at Hodges' house. Hodges told him he could still play college football, and he whipped out several junior college brochures. But Kevin wasn't thinking about football; he was thinking about getting pelted with apples the next day in school. It was a long first walk through the hallways that day. The big man on campus was now the big embarrassment on campus, and, that first week back, witnesses say Kevin heard caustic comments such as, "Where you going to school now?" and "Hey, I choose Cal." During a Fernley basketball game in Sparks, Nev., the opposing fans even wore T-shirts that said, "I'm Going to Cal." It was demeaning and predictable, but, by and large, most of the Fernley students were patting Kevin on the back and encouraging him to graduate. He apologized to anyone who stopped to talk, apologized to Hodges, his teammates, to Kribs. But only Kribs' response really mattered to him. He had considered Kribs "my other father," and it was clear, right away, that their relationship was severed, understandably so. Kevin had lied straight to Kribs' face about the e-mail from the Cal offensive line coach, and he sensed an obvious iciness now from Kribs. It made Kevin sob, and, worse, it made him reprioritize the sport of football. "I knew I wasn't going to play, and I honestly didn't want to play, I was so down on myself," Kevin says. "I mean, it's a game of egos, and when you have one sky-high and then you have one at absolutely zero, it's tough to play. "When your whole life gets flipped upside down because of something you do, you don't know where to go. So college football was not on the list of places I'd go from here. I figured, 'Why would anyone take a chance on me?'" So Kevin stopped working out, stopped counting calories, stopped checking the Pac-10 Web site, stopped dreaming. 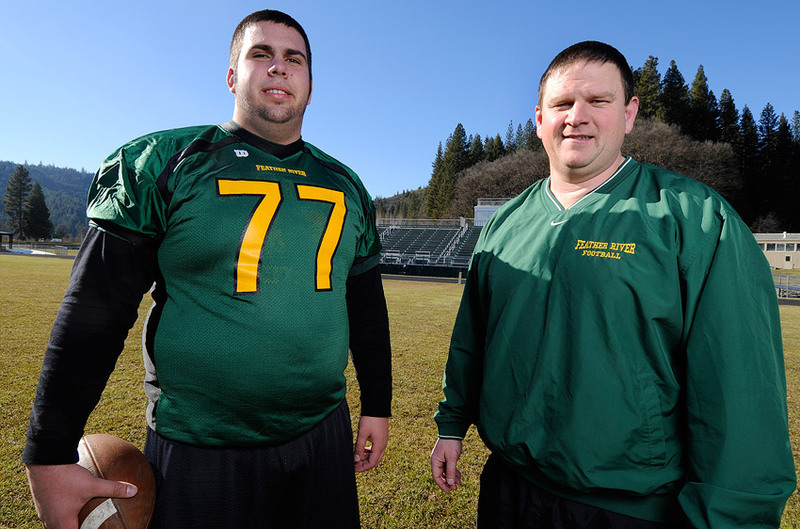 Tom Simi, right, coach at Feather River College in Quincy, Calif., felt Kevin deserved a second chance. "This kid could use a friend"
or at least get you on TV. About two hours northwest of Fernley, across the border in Quincy, Calif., an athletic director from a tree-lined junior college watched a recap of the scandal on the local news -- and got an idea. "This kid could use a friend," Merle Trueblood thought to himself. So that's how, after Kevin Hart tried to get out, he got dragged back in. That's how Hart improbably began getting recruited again. The school was Feather River College, and Trueblood was soon in touch with his football coach, a bright, congenial up-and-comer named Tom Simi. Long before Kevin's news conference, Simi had heard about a supposedly sturdy offensive lineman from Fernley, although he didn't know his name or his measurements. He had called the school at one point for information, but not even Hodges responded, and Simi assumed the kid wasn't interested. But when he was alerted of Kevin's hoax, by a local newspaper, Simi put two and two together -- Oh, that's the Fernley kid. Interesting. Simi and Trueblood decided to reach out to Fernley High again, curious whether Kevin was an evil kid who had staged a premeditated scam or simply a lost soul. A non-football coach told them it was the latter, that he was a good person who got caught up in a fantasy and "didn't know how to pull the plug." Simi began calling Kevin's home, in March of '08, but the family was screening calls and wouldn't pick up. Simi left upbeat voice messages, but it didn't matter because Kevin was through with football. "To me, it was over," Kevin says. "I was like, 'Maybe I should focus on other things instead of football.' Because that's kind of where I lost myself -- football got me into this mess. I hadn't been doing things the right way and maybe I was kind of afraid of playing again, and that's the reason I didn't answer the coach's calls. Because I was afraid of being around new people who had heard about me." But Hodges, who wasn't leaving for Hermiston until after the school year, kept handing Kevin junior-college brochures, kept bellowing, "You can still do this; you can still prove what we all thought of you." Betts' pep talk was: "Life shouldn't be over at 18. You have your whole life ahead of you." He was getting double-teamed by his coach and teammates, but nothing kicked in until Kevin began receiving stacks of out-of-town mail. They were post-marked from everywhere -- as far away as the East Coast -- and Kevin was half-afraid to open them. "I thought it was hate mail," he says. But he took a peek, and most of them were better than recruiting letters. These people were writing, "Keep your head up," or "You can still achieve your dream," or "Good luck to your family," or "Everybody makes mistakes." The notes had him in tears. He even received a benevolent letter from a local Reno judge, and he pinned all the notes on his bedroom wall and began reconsidering something near and dear -- college football. He went online and filled out the Feather River football questionnaire, and, in May, when Simi happened to be casually checking his e-mail, there was Kevin Hart's name, address, height, weight and grade point average. Simi called right away, because you can never have too many linemen, and he spoke first to Kevin's mom, giving her insight into Feather River. It was a community college, meaning, in the purest sense, the community was welcome there. The student body included 40-year-old single parents, people with disabilities, war vets; a scorned football player was certainly no stretch. "It's a pretty forgiving place," Simi says. Eventually, Simi contacted Kevin and filled him in on his background. He was a former offensive lineman himself, from Eastern Oregon, who preferred smashmouth football. "When I was playing, I'd be ticked when we'd throw," Simi says. "I love sticking it up people's tailpipe. Maybe that's why I'm such a run-oriented coach." Kevin got a kick out of that. He also liked that Simi had sent six offensive linemen in the previous two seasons to D-I or D-IAA programs. It meant Kevin could actually allow himself to dream about D-I again. And never discount someone's dream. 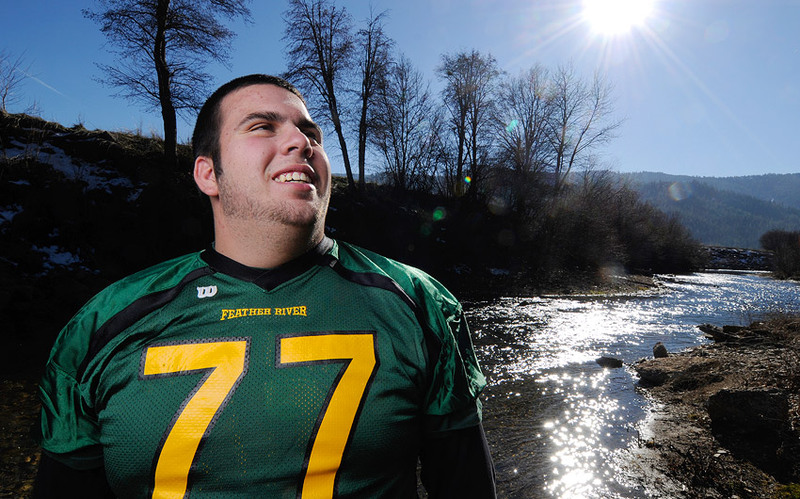 At Feather River, Kevin can bask in the promise of a fresh start. When he reported to training camp, he asked for No. 77 -- you-know-who's number. But, other than that, Chris Kribs never would've recognized Kevin. Because the kid was 30 pounds overweight. 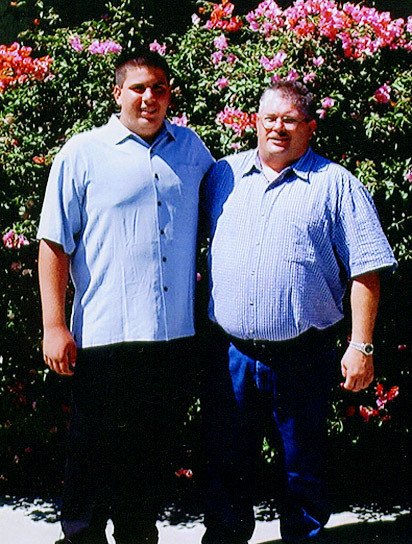 All that inactivity after quitting football had hurt Kevin's physique, and he came into Feather River a chubby 325 pounds. Inevitably, he tweaked his knee, which only set him back further. But Kevin's larger concern was his teammates, and whether they were gossiping behind his back. 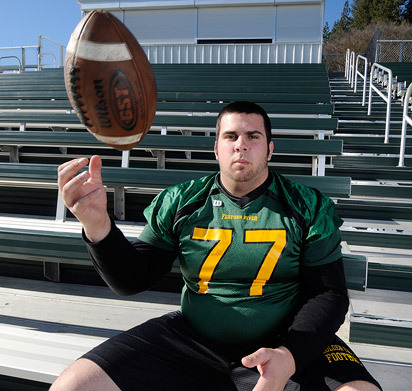 He had worried he would be ostracized, especially because 40 percent of Feather River's players came from Nevada. But other than a few "Go Cal!" jabs, no one said much of anything. "We've got so many damn knuckleheads -- and I mean that in a good way -- that he just fits right in," Simi says. Simi deserves much of the credit, because on Day 1, he called the team together and asked everyone to name his hometown area code. There were a bunch of 702s (Las Vegas) and 843s (South Carolina), but then the coach asked, "What's the area code here?" "So, guess what, we're all 530 now," Simi said. It was his way of saying they were a team, that everyone was on equal footing -- and Kevin quickly assimilated. Whenever the South Carolina kids would start bragging about the SEC, Kevin would chime in and say not to sleep on the Pac-10, Cal's and Oregon's conference. It made for a great debate, and several kids suggested Kevin host his own college football show, call it "Hart to Hart." They considered him one of the guys, but more than that, the lie seemed to be in the rearview mirror. Simi kept an eye on the kid, and when Kevin ended up on the second team and didn't play in the season opener, Simi was worried how he'd react. But Kevin kept telling the coach not to sweat it, that he was just grateful to have his 77. "Every day I walk onto the football field, I say, 'Second chance,' and 'Time to have a good practice -- because you probably shouldn't be here,'" Kevin says. "Practices are still hard, but I still love every one of them because I know how fortunate I am to be here. I was just looking for a chance to play somewhere, and they gave me a chance. "I'm not OK. I think it'll be tough forever. I mean, it's just always there," Kevin tells ESPN in his first in-depth interview since the incident in February 2008. "Every day is a struggle for me. I'm not OK. I think it'll be tough forever. I mean, it's just always there. It might not be 10 years until I'm finally, like, OK. Maybe I can put this at ease, and maybe it'll never be. But maybe that's a good thing. Maybe knowing that what I did was totally wrong and a horrible thing is a good thing to be reminded of every day. I think it's helped me become a better person now." He remembered what Hodges told him -- "You can still prove what we all thought of you" -- so Kevin wrote Prove Them Right on his cleats. He brought some of his fan letters to school and posted them on his dorm-room wall. He seemed focused and began impressing Simi more and more. "Blackballing the kid -- what was that going to accomplish?" Simi kept saying. "I'm glad he's here." From a football standpoint, Kevin still had a way to go. His first step was slow; his body needed tightening; and he was more advanced in pass-blocking than run-blocking. He also held his hands a little too wide in pass protection, and, one day, Simi told him he doesn't teach his players to block that way. "But Bill Callahan, the old coach at Nebraska, does," Kevin said. Simi's jaw dropped. What junior college kids knew that? Kevin also pontificated on the techniques of Alex Gibbs, the former Broncos O-line coach. This was no dumb kid, the coach thought. "I can have a pretty high-level conversation about football with the kid," Simi says. "He's coachable. He's yes sir, no sir. He has to do a better job of gaining leverage on defenders, being more physical at the point of attack in the running game. But he loves the game, and he's got a mean streak. He cares about becoming a good player." Kevin made his season debut in Week 2, off the bench. And in Week 5, he came off the bench again, springing a halfback for a long touchdown run but then pulling a hamstring chasing the play. "Kevin, you're not fast enough to pull a hamstring," Simi said on the sideline, making the kid crack up. Everything seemed perfect. Trueblood saw Kevin smiling on campus one afternoon -- "One of the best days of my life," Trueblood says. "That's what we're here for, to help kids" -- and Kevin was feeling brave enough to reach out to his old Fernley coaches." He reconnected with Hodges, who was in the process of taking Hermiston to the Oregon state quarterfinals, and Kevin also was hoping Kribs was ready to forgive him. The answer: maybe. 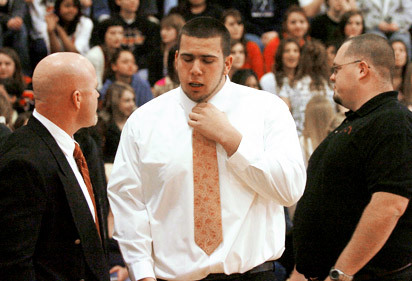 Kribs, who was still coaching at Fernley, was told by the school to not comment. But he did say, pleasantly, "I wish Kevin all the luck in the world." until Simi got a surprise call from a guidance counselor. It turns out Kevin had been skipping two of his classes. He'd never been interested in school -- not as a 7-year-old and not now -- and still hadn't learned how to make class a priority. It was an old habit by now, years in the making. Plenty of freshmen struggle with school, especially JC kids. They're away from home for the first time and can't handle the freedom. But Kevin couldn't afford to be careless, not after the lie. The teachers at Feather River would've helped him. They almost never fail a kid who shows up every day, a kid who tries. But they'll drop the repeated no-shows if they don't pay heed to the warnings. So by the time Kevin's hamstring healed -- in Week 8, with two games left in the season -- he suddenly didn't have enough credits to be eligible. He couldn't play. At Fernley, maybe they would've looked the other way, but at Feather River they were doing him a favor, by actually looking at his report card. "I told him, 'There's no shame in not starting, but there is shame in not making it in school,'" Simi says. Kevin told Simi he understood, and ever since, he has been a model student. If he stays eligible for next season, it's all in front of him. The starting right guard position, Kribs' old spot, is up for grabs, and Kevin -- finally off the powdered doughnuts, finally in shape -- will get a shot at it. If he starts, D-I scouts will undoubtedly see him play, and even if he's a backup, there are NAIA and D-III schools that love junior college transfers, that are dying to have a 300-pound lineman with a high football IQ. He just has to work on his sociology and English IQ. Because if he doesn't, the wish is over. And the only person Kevin Hart would have been lying to all this time was himself. Join the conversation about "The Boy Who Cried Cal." On Super Bowl Sunday, American military personnel stationed in Iraq will enjoy a couple of historic cold ones. As Pat Summitt closes in on her 1,000th career victory, her son Tyler reveals some of the coach's secrets. Thirty years ago, he offered Terry Bradshaw a spelling lesson and snorted cocaine during the Super Bowl. Hollywood Henderson comes clean about his flamboyant life. Think the last 12 months were rough? It could be worse. You could be a sports fan in Seattle. Julius Erving and his daughter, Alexandra Stevenson, are forging a relationship, 27 years after her birth. "Outside the Lines" spends a week with crosstown rivals in San Diego, two football programs in different worlds.